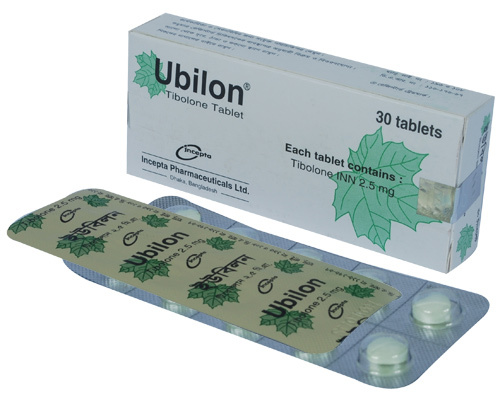 Ubilon : Each tablet contains Tibolone INN 2.5 mg.
Tibolone is a synthetic steroid with tissue specific estrogenic, progestogenic and androgenic effect. Following oral administration tibolone is rapidly metabolized into three compounds, which contribute to the pharmacological effects of tibolone. Two of these metabolites (3 alpha-hydroxide-tibolone and 3 beta-hydroxide-tibolone) have predominantly estrogenic activity, a third metabolite (delta 4-isomer of tibolone) and the parent compound have progestogenic and androgenic activities. * Treatment of the climacteric symptoms [hot flushes, sweating, vaginal dryness & less elasticity, mood disorders, anxiety etc.] resulting from the natural or artificial menopause. * Prevention of postmenopausal and post oophorectomy osteoporosis and improvement of bone-mineral density in patients with established post-menopausal osteoporosis. * Prevention of frequent UTI and urinary incontinence in postmenopausal women. Climacteric symptoms & other post-menopausal problems in adults and elderly women: The dosage is 2.5 mg tablet per day, preferably at the same time of the day. Symptomatic relief occurs within few days, but optimal results are obtained minimum after 3 months. Osteoporosis: To prevent osteoporosis in post-menopausal women or after oophorectomy an uninterrupted longer (5-10 years) therapy of 2.5 mg daily is needed. In case of natural menopause: To avoid irregular & abnormal bleeding, ubilon should be started at least 12 months after last natural bleeding. In case of artificial menopause : Treatment should be started immediately. If someone switches from estrogen-only preparation, she should start after a withdrawal bleeding. If someone switches from sequential HRT preparation she should wait for the completion of the progestogen phase. If someone switches from continuous combined HRT, she can start any time. In case of missed pill: If no more than 12 hours have passed, the pill should be taken immediately. Otherwise the next dose should be continued as before. Generally tibolone is well tolerated. However, a few adverse reactions have been observed like headache, pre-tibial oedema, change in body mass, dizziness, rash and abdominal pain. Vaginal bleeding may occur mainly during the first 1-3 months of treatment. Tibolone is contraindicated in pregnancy and lactation.